Marano and martyr; born at Tartas, Gascony, about 1623; died at Lisbon Dec. 15 (22), 1647. 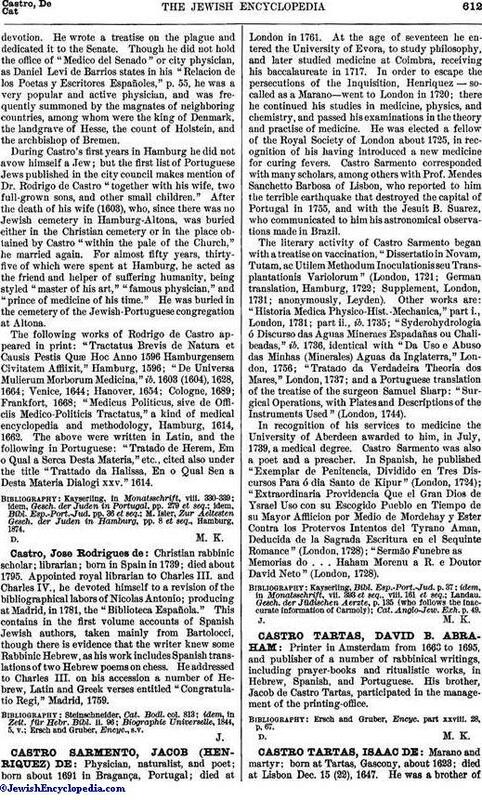 He was a brother ofDavid Castro Tartas, and a relative of the physician Elijah Montalto, and was himself trained in philosophy and in the classical languages. Early in life Isaac went to Parahiba, Brazil, where he lived for several years. Against the wishes of his relatives there, he went later to Bahia dos Santos, where he was recognized as a Jew, arrested by the Inquisition, and sent to Lisbon. Summoned before the tribunal of the Inquisition, he at once avowed his belief in Judaism and his determination to remain true to the faith. All the endeavors of the inquisitors to convert him to Christianity were in vain. On Dec. 15 (22), 1647 (not Sept. 23, as was erroneously supposed), this young man was led, together with five fellow-sufferers, to the stake. In the midst of the flames he called out in startling tones, "Shema' Yisrael! [Hear, O Israel!] The Lord our God is One!" With the word "Eḥad" (One), he breathed his last. For several years the public of Lisbon repeated his last words, so that the Inquisition was finally compelled to interdict this confession of the Jewish faith, under the threat of severe punishment. It is said that the martyrdom of De Castro Tartas so affected the hardened inquisitors that they determined to cease burning heretics at the stake. In Amsterdam the tragic end of this promising young man occasioned deep mourning. 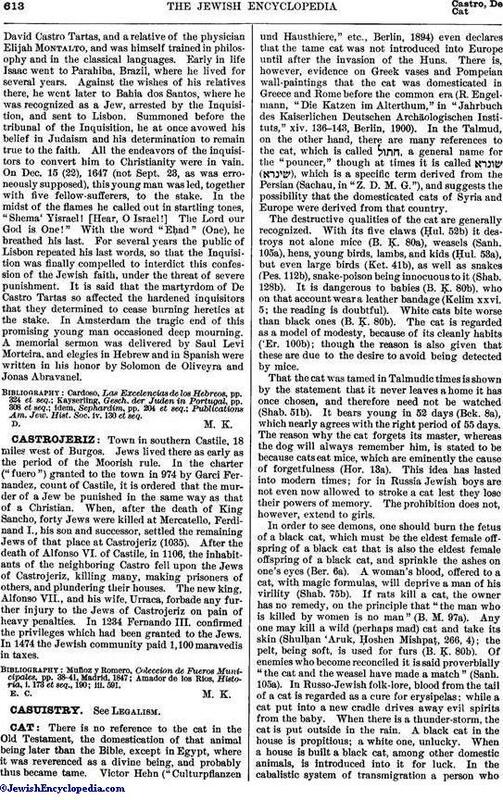 A memorial sermon was delivered by Saul Levi Morteira, and elegies in Hebrew and in Spanish were written in his honor by Solomon de Oliveyra and Jonas Abravanel. Publications Am. Jew. Hist. Soc. iv. 130 et seq.